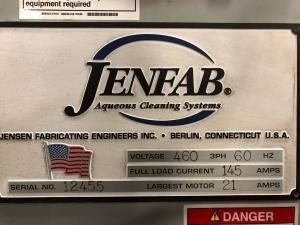 This used JENFAB 3 Stage Pass-Thru Parts Washer is designed to clean parts by directing spray impingement and volume of solution delivery at components as they are positioned and travel along a conveying belt through was, rinse, inhibit and dry zones. Spays are located above and below the belt. As an option, spray can also be directed and delivered from both sides on to the component. The proposed machine is wired to Jensen Fabricating Engineers, Inc. interpretation of the NEC code for a 480 volt, 3 phase, 60 cycle system supply. A NEMA-12 enclosure is mounted to the side of the machine. All electric functions terminate in this central control panel. This requires only one electrical connection by the customer. Step down transformer for 110 volt single phase for all push buttons and controls. All wiring is run in galvanized conduit with flexible connections to all motors and controls. Hard wiring is used on the entire machine. 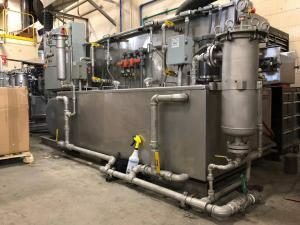 For purchasing information, email sales@blast-wash-systems.com or Contact Us.